Wortelen is a table made as part of our bespoke service for the hall of Het Ambachtslab. It is not available for purchase, but may serve as a model for a custom piece specially for you. Wortelen has an intricate base with multiple irregularly dimensioned legs and rails, inspired by the irregularity of the roots of the old bonsai tree for which it serves as a base. That is what its name refers to in the first place: wortelen is Dutch for ‘roots’. This table was made as part of an effort to turn Het Ambachtslab into a proper home for the various craftsmen and creative entrepreneurs that dwell in it. ‘Wortelen’ also means ‘to root’ in Dutch and this table is meant to symbolize that process. The table base was made out of wood reclaimed from the very building itself. Wortelen has a complex base consisting of multiple legs and rails, each with a different height and position, resulting in a crisscrossing of components at different levels. The rails fit into the legs with blind mortise and tenon joinery. Whenever rails meet one another, they do so with the halving joint. Both the legs and the rails are made out of meranti that was left as waste after the construction of the entrance of Het Ambachtslab, in which Atelier Espenaer had taken part too. Slender sticks cut out of salvaged black locust from Amsterdam connect and support the rails at various points in the base with blind mortise and tenons. On its left side Wortelen features Espenaer’s signature triple sticks, cut out of oak, again joined with blind mortise and tenon. On top of the table base rests a beautiful reclaimed table top of marble. The marble shows a variety of hues ranging from blue to pink that perfectly match the deep brown color of the table base. 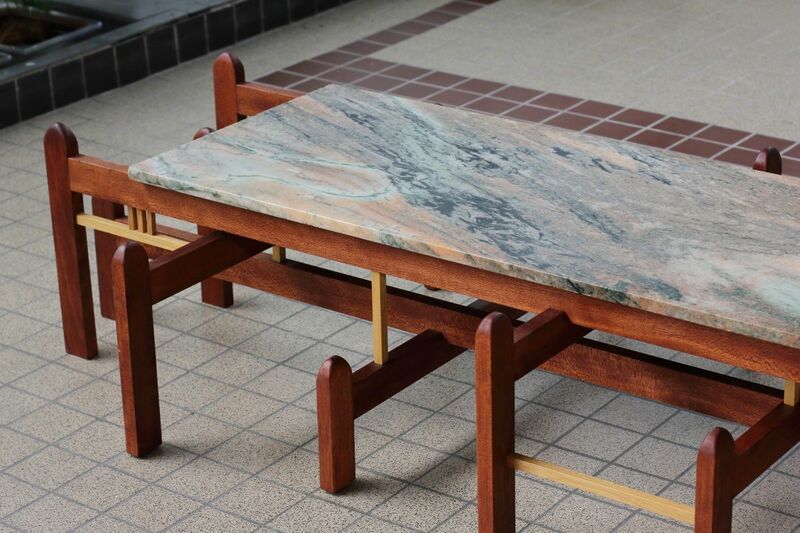 The marble was donated by a fellow dweller of Het Ambachtslab, upside down bonsai, who also owns the bonsai tree for which this table was built. Wortelen was entirely crafted by hand using traditional hand tools and techniques. The legs and rails were cut from a beam of reclaimed Meranti with a Western-style saw and subsequently flattened and smoothened with a set of Western-style hand planes. The slender sticks were cut in a similar fashion out of salvaged Black Locust from Amsterdam, acquired through the foundation Stadshout. The mortise and tenon joints in Wortelen were all cut by hand using a set of Western-style chisels and dovetail saws. The round peaks of the legs were handshaped using a combination of tools, including a saw, a hand plane, and a file. The table was finished with three coats of boiled Tung oil.